COLORADO SPRINGS, Colo. — A select group of 16 triathletes and multisport fans can register now for a once-in-a-lifetime opportunity to train and live like Olympic hopefuls at the U.S. Olympic Training Center, which will host the second annual USA Triathlon Foundation Fantasy Camp on April 30-May 4, 2015, in Colorado Springs, Colorado. The four-day camp features swim, bike and run training sessions with accomplished elite triathletes, including Olympians Greg and Laura Bennett, Jennifer Gutierrez, Barb Lindquist and Susan Williams, and two-time IRONMAN World Champion Tim DeBoom. The support staff for the camp also includes Bobby McGee, famed running coach and USA Triathlon Performance Advisor, and Alan Webb, the American record holder in the mile who made the switch to triathlon in 2014. Camp participants will also get an exclusive tour of the U.S. Olympic Training Center and explore the surrounding Colorado Springs community, including the Manitou Springs Incline and Garden of the Gods. 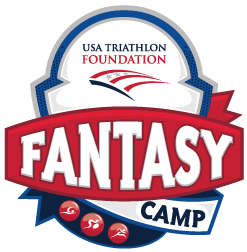 For the complete 2015 Fantasy Camp schedule and to register, visit usatriathlon.org/fantasycamp. Attendance is limited to 16 participants ages 18 and older, and registration ends on April 15. The minimum $2,000 registration fee covers the cost of room and board at the U.S. Olympic Training Center in Colorado Springs, plus meals, training and educational sessions, a personalized bike fit, consultations with USA Triathlon Certified Coaches and nutritionists and more. Any additional funds donated by camp attendees will be used by the Foundation to encourage youth participation, provide increased access for paratriathletes and support Olympic dreams. In 2014, USA Triathlon Foundation welcomed 14 individuals to Colorado Springs for the inaugural USA Triathlon Foundation Fantasy Camp. The camp offers a best-in-class opportunity for athletes to learn from top USA Triathlon Certified Coaches and elite triathletes. The USA Triathlon Foundation was created in 2014 by the USA Triathlon Board of Directors as a separate tax-exempt 501(c)(3) entity. Under the leadership of its Trustees and Committee members, the Foundation serves as a means to create a healthier America through triathlon, and seeks to open up new pathways to the sport through the generosity of donors. USA Triathlon Foundation operates with the belief that every child should have the chance to participate, every paratriathlete should have the opportunity to compete, and every elite athlete should chase his or her Olympic dream. Donations to the USA Triathlon Foundation ensure America’s youth are introduced to the benefits and fun of a multisport lifestyle, athletes with disabilities receive the training, support and gear to be able to participate and excel, and the best athletes have a pathway to the Olympic Games. Visit usatriathlonfoundation.org to learn more and donate today.